Our largest data users (see the members below) were asked to take part in a workgroup. The purpose of the workgroup is to provide feedback on our current data infrastructure as we work to design and implement our new systems. The MHDO wants to improve the collection and release of data as well as communications with partners to ensure their needs are met. The following are scheduled from 1:00 - 3:00 pm on the last Wednesday of the month, every two months. The location of the meetings are TBD, as well as the call in information. Documents will be made available as dates near. 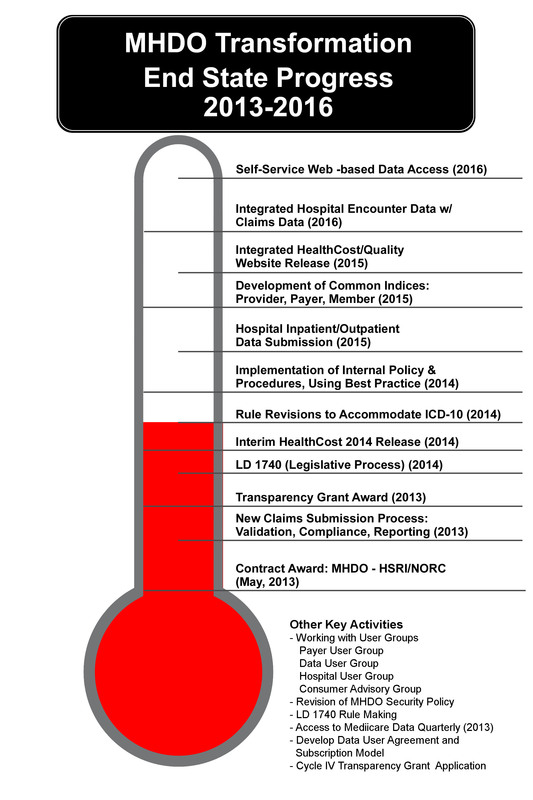 Proposed Hospital Data Versioning System, Structure, etc. From May 2016 through May 2017 there were two subcommittees: Hospital Subcommittee and APCD Subcommittee. For their meeting information, please go to their pages.